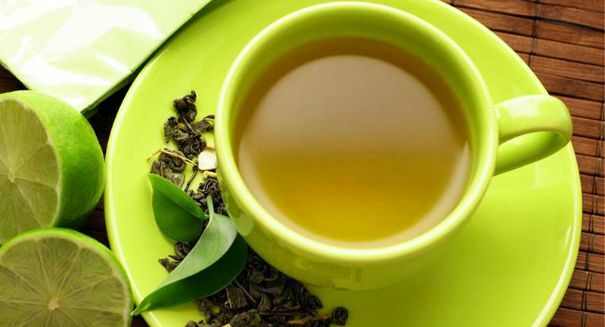 Green tea was in the news after a 16-year-old girl turned yellow from jaundice after drinking tainted green tea, but most people don't realize just how healthy it is -- and how ancient its history is. That delicious cup of green tea you just took a sip out of for breakfast this morning may seem like a routine experience for you, and you can take thousands of years of incredible history for that. Green tea got some bad press lately with the revelation that a 16-year-old girl in the UK came down with hepatitis and severe liver damage after ordering green tea from a suspect Chinese online herbal company that apparently had some unwanted extra ingredients in it, but green tea is in fact one of the most healthy substances you can ingest, as long as there are no foreign substances added to it — and that history goes back thousands of years. Green tea comes from the leaves of Camelia sinensis, which have undergone some minimal oxidation during its processing. And, not surprisingly, it goes back to one of the most ancient civilizations around today: China, a land often associated with ancient herbal remedies. Green tea has even become a fad of sorts, with many advertising its antioxidant properties and even some promising it will help you lose weight — something that duped the 16-year-old girl in question to drinking three cups per day of a tainted version of green tea. But green tea, for all the praise it gets from the medical community, is no miracle beverage. Obviously, simply drinking green tea won’t make up for poor diet or a lack of an exercise regimen. But many studies have highlighted the tremendous benefits of green tea, which seem to have positive benefits on the cardiovascular system, which in turn can improve brain function. It has also been shown to relieve stress, which, even if it doesn’t improve the length of your life, can certainly improves its quality. But just where did green tea originate? The consumption of tea in generally traces its routes to ancient China some 4,000 years ago, when the first of herbal teas began being made by locals. Green tea itself was first believed to have been brewed in 2737 BC during the reign of Emperor Shennong. In fact, there is a even a book that was written between 600 and 900 AD that is considered important to green tea history. It was written during the Tang Dynasty. Another book, translated as the “Book of Tea,” was written in 1191 and describes green tea’s positive effects on five vital organs, as well as how to grow the tea leaves. Today, you can find vast tea plantations all across Asia, even beyond China itself, although it originated in southwest Cina during the Shang dynasty and was used as a medicinal drink. Tea in general first made its way out of the confines of China’s borders when it was introduced to Portugese priests and merchants who had visited China back in the 16th century, and this discovery may have spurred Great Britain’s modern-day obsession with tea, which began in the 17th century. In fact, it was the British’s love affair with tea that caused them to introduce tea production to India back when it was one of their colonies in order to compete with the Chinese. Although there are many types of tea, Chinese green tea is perhaps the most popular found in that country. A total of 600 different cultivars produce Chinese green teas from the Camellia sinensis plant, so there are lots of varieties and great differences in regional teas. And the leaves are treated in an entirely different way depending on the regions. The Chinese prefer to pan-fire their leaves, whereas the Japanese prefer steaming. Some other processes include oven drying the tea or drying it in the sun. As a result of these different techniques, many claim that Chinese teas have a more earthy taste than their Japanese counterparts. Today, China still dominantes production of green tea, producing more than 80 percent of all green tea, with Japan coming in at second with a little less than 10 percent, followed by Vietnam at 6.8 percent and Indonesia at 2.1 percent, according to 2006 figures. That comes out to nearly a million metric tons of green tea produced world wide between all of them. So what’s the proper way to serve it? Generally, usually steep the tea in hot — but not boiling — water. You should keep it in the water for two to three minutes to make sure all the flavors are observed into the water. However, higher-quality teas are known for being steeped in cooler liquid and for a shorter period of time, as steeping it for too long in too hot of a liquid will result in a more bitter taste. Regardless, if you enjoy a cup of green tea, know that you are enjoying a guilt free, tasty beverage that is good for your body as well as your mind.